Terrible criminal in black balaclava pointing gun. Close-up of Caucasian killer with big brown eyes looking into camera. Lifestyle. Danger. Night. 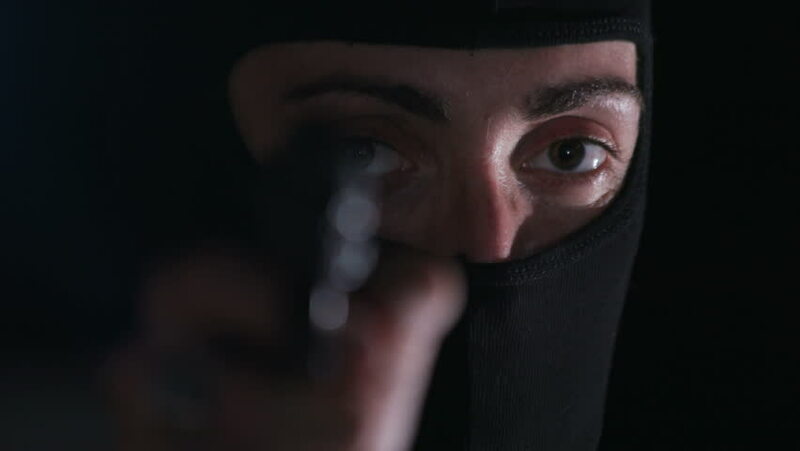 4k00:20Face of dangerous criminal with big eyes wearing black clothes and balaclava. Portrait of intrude holding gun. Close-up. Crime. Darkness. hd00:29Horror kidnapper and scared hostage, surreal video expression. 4k00:08Close-up of beautiful young sphynx cat looking at camera in the cozy bedroom. 4k00:40Car fault on the highway in the countryside at night. Young driver coming out of the vehicle with backlight flickering.